Robert Woodhead Ltd is this year’s winner of the national Constructing Excellence Award for Value, for its work with A1 Housing, Bassetlaw District Council and EEM Ltd on ‘Rethinking Housing Delivery’. The national Constructing Excellence Awards focus attention on some of the most important issues for the sector. They recognise the very best companies, collaborations and projects sharing best practice and inspiring others to adopt new and better ways of working that deliver outstanding results. The winning development at Smith Square in Harworth is creating 71 new affordable homes for local people. It is being delivered for A1 Housing and Bassetlaw District Council by Woodhead Living, the company’s specialist housing arm. The scheme, which has just completed its second phase of works, has from the start of the programme not just been about bricks and mortar. Collaboratively the partners are committed to creating a legacy for the local community. The site team has already worked with a number of local people, giving jobs to one tenant living just yards from the site, as well as offering more than 300 work placements through a partnership with North Nottinghamshire College. Locally, Woodhead has also worked with a number of sub-contractors to ensure the project has supported the local economy. Craig Pygall, Construction Director for Robert Woodhead Ltd, said: “Already an award-winning site, we’re delighted to be able to celebrate another fantastic achievement for this collaborative programme of works. 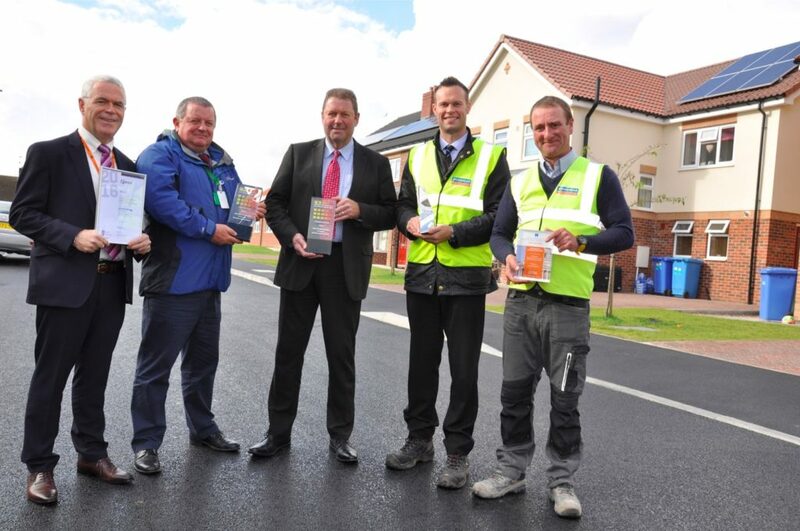 Don Spittlehouse, Managing Director of A1 Housing, said: “We are very proud that a new approach to Council Housing in a small North Nottinghamshire town has gained recognition on a national level and has won the support of our peers in the construction industry. The award-winning development has already replaced a total of 43 Airey Houses – a pre-fabricated house built in the 1950/60s – with a mixture of two, three and four-bedroomed detached and semi-detached houses and bungalows. The remaining 28 homes will be built over the coming year as part of phase three of the scheme. The homes will be highly efficient, in stark comparison to the Airey houses, which formerly occupied the site. The 60-year-old properties had an energy efficiency rating of ‘G’, costing residents between £50 to £60 a week to run. The new homes are rated ‘B’ just a few points off an ‘A’ rating and are expected to reduce fuel bills dramatically. Looking at the lifetime of the properties, Woodhead Living also installed a sprinkler system into each of the properties, which following design clinics on site, was given a mains feed rather than a tank system, to reduce the lifetime costs of the build for the client.